On Sunday, E. and I visited the street fair in the San Telmo neighborhood. 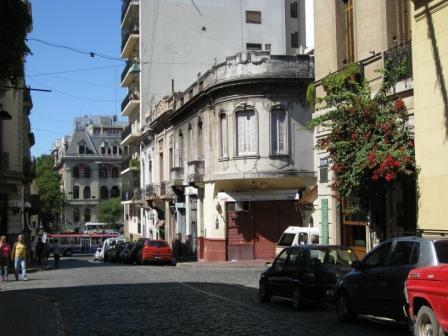 San Telmo is closer to the city center than Palermo is. It’s a little grittier than our area, and the buildings are more quaint and short. The architecture hearkens back to the 19th and early 20th centuries. Supposedly, the city’s rich lived here until an outbreak of yellow fever when they all packed up and moved to the upscale Recoleta area. Now the area is a more affordable haven for artists and city lovers who also appreciate the architecture and romantic narrow streets. We walked through the San Telmo street fair on Sunday. There were many antique offerings and the usual tourist crap sales. 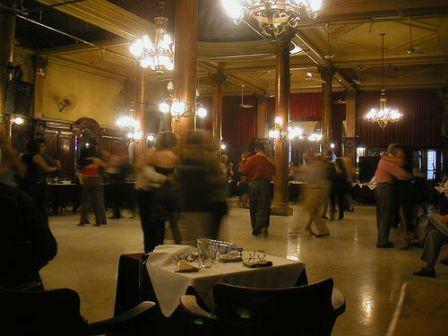 There were a few tango portenos dancing for a change. A smartly dressed old man played his guitar and sang in a doorstep. He posed with the ladies for a peso. I would like to live in this neighborhood because of the architecture, but I would not like living in the middle of the sprawling tourist street fair every weekend. I’ve grown attached to Alto Palermo and the neverending parks and dogs. There is a local cafe that charges $1.20 U.S. for a cafe latte and serves it with honey cake. It’s hard to beat that. I haven’t even begun to discuss the world’s most luscious and indulgent ice cream.